Disagreement is a natural thing which is usual in a work environment. When a meeting occurs and there are multiple solutions amongst the colleagues then disagreements are inevitable. When a solution is chosen, it naturally leads to disagreement with another team who offered solution. When disagreements are left unresolved then it becomes more problematic and leads to draining away employee’s time, confidence, energy and productivity. When workplace disagreements are resolved more dividends can be reaped which include mutual respect, sense of trust and a positive relationship. Let’s glimpse into a few tips on how to disagree agreeably and few successful tips for disagreement. Any problem in an organization can be seen from the opponent point of view. In order to give respect it is necessary listening to everything and considers what the other person has to say. Instead of responding to the answer make sure to focus on others perspectives, experiences, influences and agenda. Also never forget to ask a few elucidating questions so that you are clear about what the person or team is saying. It is also good to avoid preferences, past experiences and pride in the present scenario. When there are suggestions during a discussion make it sure to disagree in an agreeable manner. The first primary ultimate task to be followed is to use the right language and do not insult or hurt others. Never in such a discussion can you mention that you’re wrong, instead use the right language so that you make disagreements in an agreeable manner. When you need to disagree, make sure to use facts. Facts are always facts and they have their own value. In that manner, bring out your opinion with studies, statistics, and real facts. By this way you can drive the people to real evidence and facts rather than personal opinion and interests. When your statements are used it shows that a person is blamed and confronted where they are put to defense. In the same manner ‘I’ statements can be used which shows that you’re in the scenario and your intention to express your point of view. Conflicts can be completely mashed by using sentences like ‘I hear what you’re saying’, ‘I appreciate your view’ and lot more. In the same manner avert words like ‘but’ or ‘however’ as they may erase the acknowledgement. When in a conversation there are people who throw out a challenge, you should make sure to bring them to a solution and do not encourage such challenges. Resolving in a tactical manner is more important rather than going forward for a challenge. 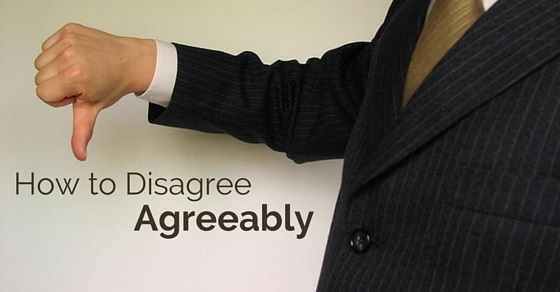 To make disagreements it is good to simply say ‘yes’, this doesn’t mean that you agree for whatever has been said. When you say ‘no’ it naturally puts the other person to an argument mode. Hence to prepare him and make him listen to whatever you say, a yes is mandatory in such situations. Experiences, profession and background are a few aspects by which any individuals view are experienced. So a softening statement should be used to recognize the same. for example ‘ As an environmental engineer I can get your points’, ‘ as a software engineer I can understand why you took such points’, ‘ as a manager who is responsible for outputs, I can understand your decision’. All these statements are softening ones and cool the arguers. By using these indicating statements or process you can outline your positions and reasons for your conclusion. You can use statements like ‘if I can I would like to say that’, or ‘let me offer you my reasons’, or ‘can I tell you my view about the conclusion’, ‘let me briefly outline the position and reason for it’. By using these sentences, your case can be put in scenario and certain agreements can be disagreed. When you have decided to disagree any statement agreeably, make sure you give appropriate reasons rather than objecting them straight away. Instead of handling straight forward ways, one can use balanced pros and cons explain why you arrived to such a conclusion. In order to disagree in an agreeable manner make sure to use strongest sentences. A few examples would be ‘so I must disagree’, ‘so I think your mistaken’,’ so I cannot agree with you’ and more. The words so are extremely powerful as they are considered to be natural and logical. When you have decided to disagree any topic in an agreeable manner make sure to disagree after listening to the discussion or topic for a long time. This shows that you show genuine interest in whatever they say and then you can offer your opinion. When you disagree without hearing their ideas, it can be too obvious that you have preplanned to object their proposal. For ones who have decided to disagree in an agreeable manner, possessing a cool attitude is mandatory.Preplan and compose you and your thoughts. It would be a good idea to pen down your thoughts, rather than memorizing in the form of speech. If you desire to be listened without interruption, it is important to stay professional. The one who is criticized can be a professional and has his own image, ego and respect and so handling any disagreements in an agreeable manner can also be appoint which should be remembered. Remember that a conflict is made and it is disagreed in an agreeable manner. The resultant should be unity in the workplace there after and not thoughts in the mind of employees that their ideas have been objected. The disagreement should be made in a way thinking about the future scenario. There should be unity in future and so disagreements should be handled in a perfect way. Whenever multiple suggestions come up make sure to understand the situation completely without interrupting and if you’re furious about what’s happening make sure to postpone your explanation for a few minutes. When you speak out in anger then the situation may result to be worse. Hence talking after some time can be better. By this way disagreements can be handled in an agreeable manner. Before you could object any idea or thought, make sure to speak to yourself and imagine the situation. Do not try to criticize any individual, just imagine an employee being criticized and the result that happens in future and so disagreements can be made after imagining the situation. Whenever a conversation is started it would be better to put forth common interest in the mind of the employees so that they come up with like-minded ideas and not others. When such ideas are posted, it would be easy to take a decision rather than to disagree any employee. They would be able to take up such decisions in a positive way rather than being avoided. n any discussion though many individuals would have contributed their ideas, the manager or the boss would have chosen just one idea or suggestion. He may have also avoided all ideas and took his own decision. Taking a decision has a number of factors in it which can be viewed only from his vision. When such instances take place, the boss should make sure to convince all the others who took effort to put down their ideas. He should respect them and thank them for giving such nice ideas but the one he took was really applicable. He should also mention that he needs the same motivation and enthusiasm in all future discussions or projects. No one is to step back as he appreciates each and every ones ideas and values it a lot. These are a few tips which can be followed in order to disagree in an agreeable manner. Any discussion can be disagreed promptly but it is really important not to hurt the other one in the opposite site. They work in the same organization and would continue to work to add success and profit to the organization, in other words all employees are an asset to the organization and hence giving respect for their ideas is important. They should be valued for all the efforts they put forward instead of being criticized. It is the duty of the boss or the manager to take responsibility to disagree any discussion in an arguable manner. These few tips can be very helpful for boss and manager to handle any situations in their organization.